- Acidity: This parameter evaluates certain alterations undergone in the oil. The higher the acidity level is the lower is the oils quality and digestibility. - Peroxide index: This detects the incipient oxidisation. Oxidisations leads to the oil going rancid. The index also gives information about alterations in the tocopherols and polyphenols, which are the oil's natural antioxidants. - K-232 y K-270: These criteria complement the information obtained from the peroxide index as well as measuring purity. The K-270 value is increased if there are fatty acids present which are different to olive fatty acids. - Wax content: Proves the genuinity of extra virgin olive oil. 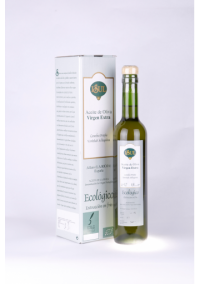 The wax content of extra virgin olive oil must not exceed 250 mg per Kg of oil. Approx. 99% of the weight of extra virgin olive oil is made up of Triglycerides (a combination of glycerin and fatty acids) and other free fatty acids. - Carotenes: responsible for colour, and a vitamin A source. Oxidisable. - Clorophylls: also responsible for colour. They oxidise easily in light however they are inoxidants in the dark. - Tocopherols: source of vitamin E. Anti-oxidising agent. - Estherols: participate in the intestine absorption of cholesterol. - Polyphenols: responsible for flavour, being the main defensive agents against the oxidisation of the oil. - Volatile components: responsible for the aromas, of particular note are the alcohols, cetones, esthers, etc.